Ebenezer couldn’t understand the sudden, horrendous pain in his feet that brought him to a halt. He tried to brush away whatever was causing him agony, but the pain spread to his hands. Ebenezer had stumbled into a hidden fire pit. When Jason was 13, there was only one thing on his mind – soccer. ‘I played at school, after school, after dinner and, sometimes, even before breakfast. That was not uncommon for boys of my age and at the time I would repeat the same routine day after day. ‘I never give it a second thought. 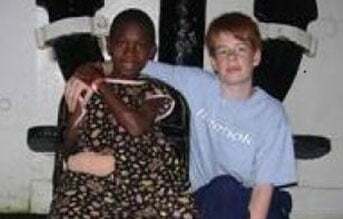 That was until I met Ebenezer in 2006 when he came to the Mercy Ship for reconstructive surgery when we were docked in Ghana. I lived on board with my family. Ebenezer was just a few years younger than me but was just as much of a soccer enthusiast as I was. 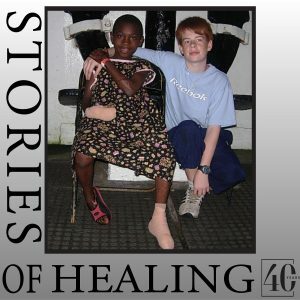 There was just one problem – his feet were disfigured and he struggled to play. 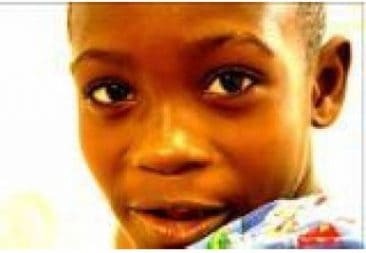 He came to the Mercy Ship for free surgery. Before his procedure, there was not much we could do soccer-wise. We gently passed the ball to each other, but because of his injuries, even this was a challenge. Despite this, he insisted on playing. After his surgery, all he wanted to do was play. He was still bandaged up and couldn’t kick a ball – I’m sure the nurses told him not to go near a soccer field. But that didn’t stop him. As he healed, we got to play more and more. The smile on his face, although impossibly large when even before the surgery, grew every time we kicked the ball around.